Alright, so I ended up running GPUGRID on an AMD EPYC 7401P thanks to Packet’s (Packet.net) trial they gave me. I ran this “cloud server” for around 5-6 days and loaded GPUGRID and Rosetta to see how much crunching power you can get for 1 [dollar/hour] (normal cost for this 24-core setup). I’ve already had the pleasure of playing with Google Compute, but I think their servers are “virtual”, unlike Packet’s solution that is a literal 24-Core CPU all for yourself. Side note: It would be interesting to see what you could get for 1 [dollar/hour] 5 years in the future! Anyways, since I ran two projects at the same time, I had to do some data tinkering to separate the EPYC’s performance on Rosetta and GPUGRID. What I did was download the PC’s tasks results into a spreadsheet (I actually had to use VBA, copy-paste 20 results at a time… there is no “download” button on the results page!) and did some good ol' maths. Take note that this CPU has 48 threads in total. Remember I ran this alongside Rosetta. Run time: 2,735,510 seconds (about 32 days)… since each WU uses 4 threads, the CPU time is 4 times this number. 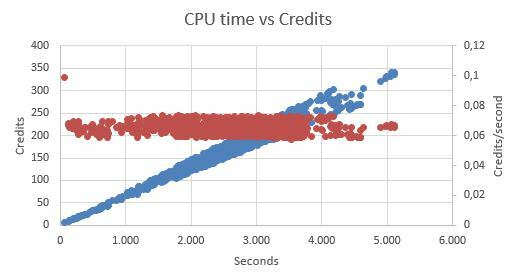 I graphed the CPU time versus the awarded credits (blue) and Credits/second (red). This is using “real” CPU time (ignoring the fact that each WU uses 4 cores). Seems the amounts of credits awarded increases linearly with time. I wouldn’t know how much faster/productive this CPU is compared to others on this project, but it seems to be a beast. About 70k per day. Anyone care to calculate their Credits/second on their CPU to compare? Message 50890 - Posted: 16 Nov 2018 | 22:28:09 UTC - in response to Message 50385. Message 50932 - Posted: 20 Nov 2018 | 12:00:56 UTC - in response to Message 50385. Amd makes a great job with these cpu. And during 2019 will be released the "Rome" cpu-server and Ryzen 2 for cpu-client.